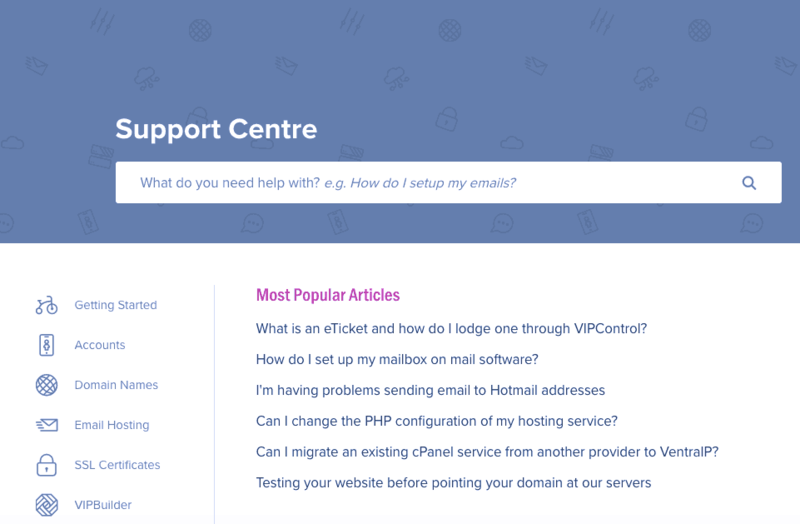 VentraIP Australia Review 2019: Is VentraIP Australia a Good Hosting? VentraIP Australia is a privately-owned hosting provider with 24/7 Australia-based technical support and a 45-day money back guarantee. It has servers located in two NEXTDC Tier III data centers and a solid uptime guarantee. Founded in 2010, VentraIP Australia claims to be the “largest privately owned web host and domain name registrar in Australia.” The company has more than 150,000 customers and several industry accolades to its name (such as #4 in consolidated .au market share and new .au registration market share). Its servers are colocated in Tier III data centers in Sydney and Melbourne. The website is in English, as is the support. 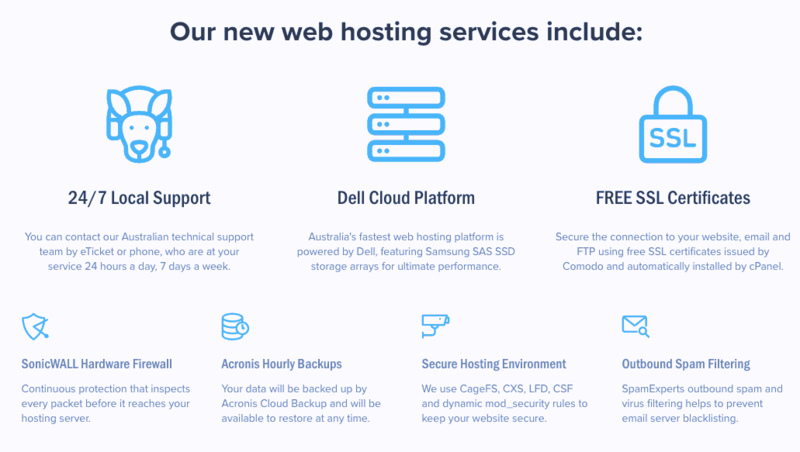 VentraIP Australia offers a comprehensive range of hosting services including shared and reseller hosting, CMS-optimized hosting, website builder packages, email hosting, virtual private servers, and SSL certificates. VentraIP Australia has servers located in two Australian data centers: one in Sydney and one in Melbourne. They are both Tier III and are ISO-27001, ISO-9001, and ISO-14001 certified. However, I always prefer it when companies own their data centers, as it generally means quicker response times to hardware issues. That said, VentraIP Australia offers a 100% availability agreement, 99.9% uptime guarantee, and N+1 redundancy on power, cooling and critical systems, as well as 24/7 technicians on-site for security and monitoring. VentraIP Australia uses cPanel, one of the easiest-to-use control panels and the most widely used in the industry today. Your websites will be hosted on robust Dell servers with Samsung enterprise-level SAS SSD storage for performance up to ten times faster than regular HDD. The servers also use Linux operating systems with LiteSpeed Web Server and CloudLinux for faster performance. All shared hosting plans come with free Comodo SSL certificates, Fortinet hardware firewall, CageFS, outbound spam filtering, and Acronis hourly cloud backups, so you can feel confident that your data is securely stored. On top of the many unlimited features (bandwidth, email accounts, MariaDB databases, add-on domains, parked domains, and subdomains), VentraIP Australia has also included built-in application caching along with Cloudflare and Railgun CDN to deliver your website to visitors around the world as fast as possible. Beginners will love the Softaculous one-click installer and the optional website building tool. More advanced users, on the other hand, will be happy to see support for Perl, CGI, PHP versions 5.1 to 7.1, and of course FTP access. VentraIP Australia’s prices are quite high, though they’re still within market range for an Australian context. The upside is that the plans are certainly feature-packed with great resource quotas. In terms of add-ons, SSL certificates are included, while domain registration is an added cost. You can also customize the base plan by adding additional CPU, disk space, and dedicated IP addresses — all at an additional cost, of course. If you can fit into the Starter plan (and most everyday users will be able to), with 5GB SAS SSD storage along with unlimited domains and bandwidth, you get a good price considering the high level of features. If the price is still too high for your budget, you can check out VentraIP Australia’s sister company, Zuver, for more affordable plans. You can buy the plans on one, three, six, 12, 24, or 36-month terms. However, there is no discount for purchasing a longer term upfront. That said, VentraIP Australia offers an above-average 45-day money back guarantee. If you’re on a budget, VentraIP Australia isn’t for you. However, if you can afford its premium price point, you’ll enjoy the feature-packed plans with SAS SSD cloud storage. Wondering how VentraIP Australia stacks up against other Web Hosting companies? Enter any other Web Hosting company and we will give you a side-by-side comparison.